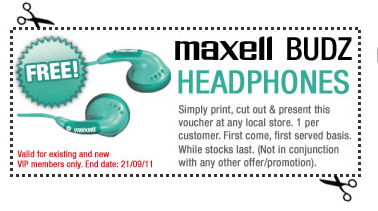 Richer Sounds Vouchers > Free Headphones Are Back! The free headphones are back. This time I'm actually going to go and get some myself. Especially after the reports on MSE saying lots of people also got a free mug and keyring as well! Last time got to the local store only to find it had been looted. I bought my Humax Foxsat HDR 500G from there a few months back, which I'm very pleased with. Unfortunately I wasn't as pleased with the channels available on Freesat, see the Freesat channel comparison to find out why. Click on the voucher, print it off, take it to your local Richer Sounds and exchange it for a Free pair of headphones. Should be as simple as that. And if your lucky, like some previous readers, you might the the free mug, keyring or maybe even something else. Just gotta love free stuff.